The Great Migration rivals the Big Five as the crown jewel of an East Africa safari. 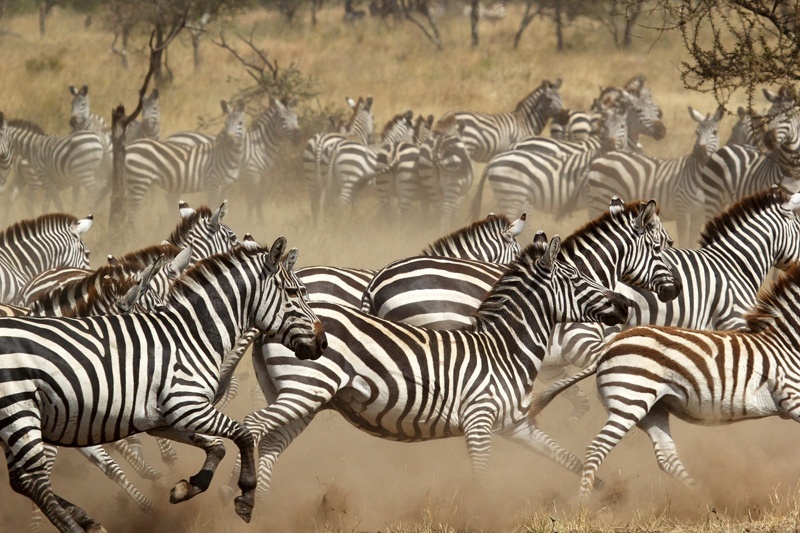 The Serengeti in northern Tanzania and the Masai Mara in southern Kenya set the stage for the mass movement of 1.5 million wildebeests and 200,000 zebras, who follow seasonal rains in a never-ending cycle across 150,000 square miles of protected wilderness. The nomadic animals have journeyed symbiotically for millennia: zebras lead the way and eat the long grasses, and then wildebeest graze on the sweet shorter stalks. The zebras remember the course and keep a keen eye out for predators, while the wildebeest employ their superb sense of smell to track down water. Thousands of gazelles, eland, and impala share the route, and the herds are relentlessly pursued by lions, leopards, cheetahs and hyenas. 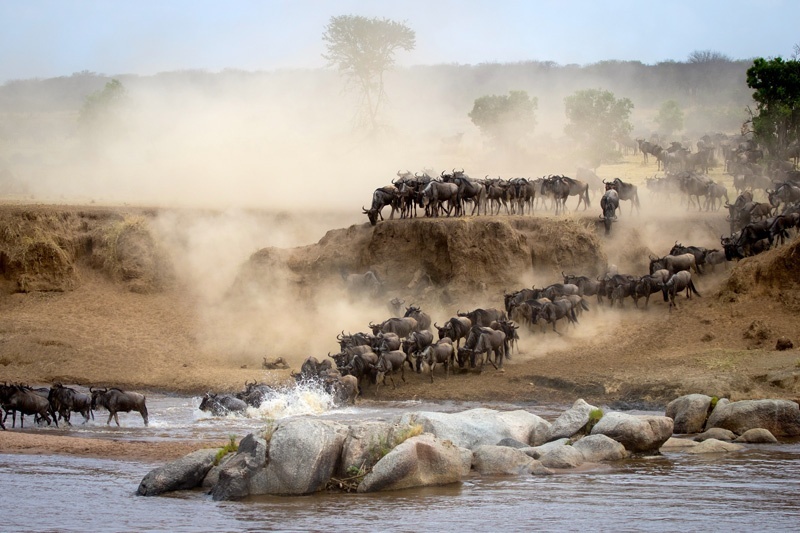 Any encounter with the Great Migration is a once-in-a-lifetime experience, but the most thrilling annual spectacles require regional expertise and proper timing. Calving and foaling happen in January and February, when newborn zebras and wildebeest take their first steps in the short grasses of the southeastern Serengeti plains. The region is beautiful and weather is excellent, so it's a great time to book Tanzania safari tours to get a glimpse of the babies as well as explore nearby areas like Lake Ndutu, where private ownership allows safaris to get closer to wildlife than anywhere else in the country! The Serengeti receives abundant rain in March and April, and the migration moves west through the woodlands. Then, when the sun comes out in May, herds turn north toward the Grumeti River and well-timed safaris watch the animals precariously negotiate crocodile-infested waters. The Grumeti crossing is exciting, but it's merely a preview of the spectacle that looms ahead. The real excitement begins in July, when herds congregate in the Northern Serengeti for mass crossings of the Mara River. The Mara crossing is the key focus of most late summer safaris, who expertly track the migration all year. Spectators feel the tension build as hungry herds face ravenous crocodiles, thrashing in a life-or-death battle against the relentless current. Only the survivors will reap the ultimate reward: lush, sweet grasses in Kenya's Masai Mara. Late summer is an excellent time to plan Kenya safari tours because the Masai Mara is full of wildlife, and the stunning crossings are still happening. 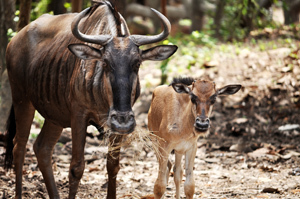 By September, zebras and wildebeest are spread out across the park’s lush plains. The herds stay in the Masai Mara until October, when thunderstorms drive them south to foal and calf in the Serengeti once again. 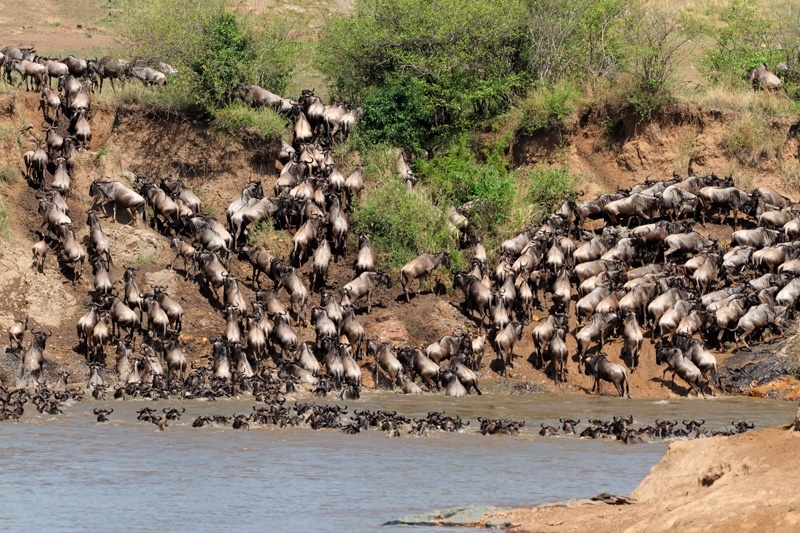 While the Mara River crossing is an unrivaled grand finale, there is plenty more to see around the migration sites. Tanzania safari tours begin in Arusha and stop at remarkable Northern Circuit highlights en route to the Serengeti. Tarangire National Park, for example, has its own smaller but just as exhilarating migration of 250,000 giraffes, buffaloes, oryx, ostriches, elephants, and lions. Another unforgettable sight is the pink Lake Manyara, covered by thousands of flamingos. 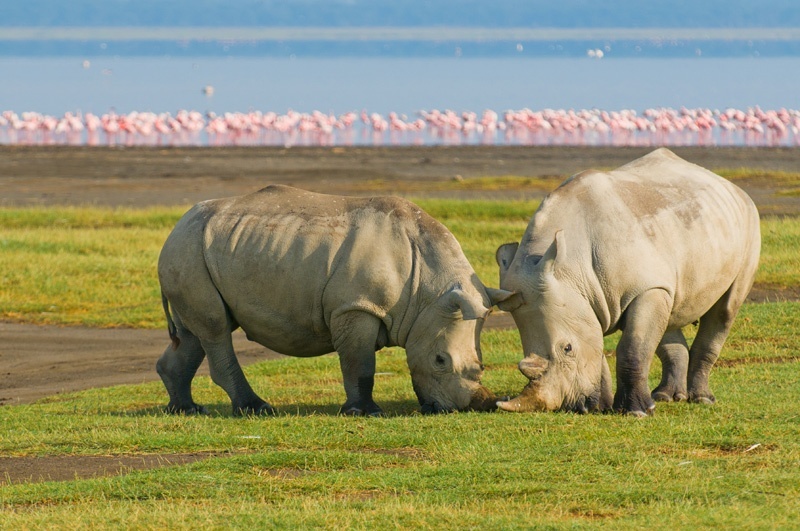 And, just inside the Serengeti sits the Ngorongoro Crater and its 25km-wide natural amphitheater with a plethora of game, including the Big Five and some of Tanzania's last remaining black rhinos. The surrounding Crater Highlands are full of coffee plantations and farms whose residents provide outstanding opportunities to visit and learn about local cultures. The Masai Mara National Park (a 4-5 hour drive from Nairobi) is a highlight of Kenya safari tours during any season. Known as "The Jewel of Africa," the Masai Mara is home to more than 40% of Africa's larger mammals, including healthy year-round populations of the Big Five, cheetahs, zebras, giraffes, crocodiles, elephants and hippos. The resident animals roam into the adjacent lands outside the park, where many Masai villages have cultivated unique relationships with the wildlife and welcome visitors. Interested in seeing this for yourself? Our expert travel specialists are ready to custom-design your next safari adventure, start planing today!